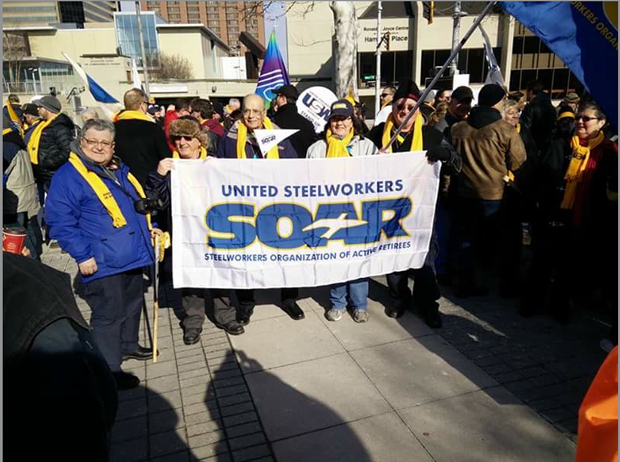 SOAR members showed solidarity with Stelco pensioners. Left to right, Dennis Lafraniere, vice-president of Chapter 6-02 in Sudbury; Peter Macleod, trustee of Chapter 6-02; Reg Duguay of Chapter 6-80 in Kitchener; and Lena Sutton, president of Chapter 6-10 in Hamilton. Steelworkers Local 1005 President Gary Howe addresses the crowd. CLC President Hassan Yussuff and Ontario NDP leader Andrea Horwath are to his right. 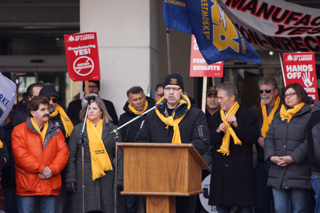 CURC Hamilton, Burlington, Oakville Area Council joined members of the Steelworkers Organization of Active Retirees (SOAR) in a Jan. 30 march to protest the decision to attack the benefits and pensions of workers at US Steel (formerly Stelco). The event drew CLC President Hassan Yussuff, federal NDP leader Tom Mulcair, provincial NDP leader Andrea Horwath and local MPs and MPPs to stand alongside the workers and their local leaders. When US Steel bought Stelco, they committed to financing the pension plan and maintaining the workforce in return for financial assistance from the federal and Ontario governments. Since then, they set up a shell company, US Steel Canada, to own the steel mill but gave it a debt of the purchase price of the mill plus responsibility for the pension plan and benefits. They then had the shell firm seek bankruptcy protection. The $2 billion they owed themselves then took legal precedence over the obligation to pensioners. Retirees have already lost their health benefits. When the courts grant the bankruptcy application, retirees would face a reduction of at least 30% in the negotiated pensions. The Ontario Pension Benefit Guarantee Fund will underwrite up to $1,000 a month in such cases but to do so the fund would need money from the Ontario government if it is to cover 20,000 retired steelworkers. 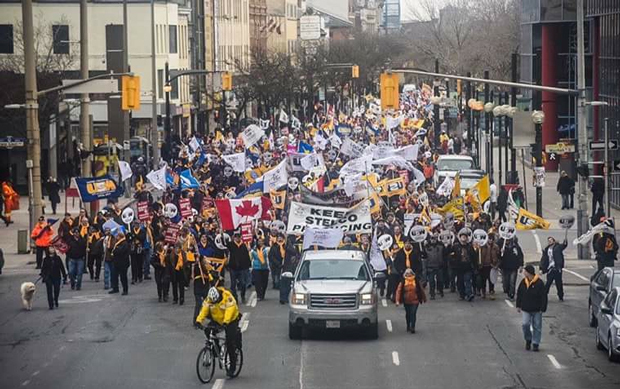 The United Steelworkers has sought to have the government of Canada take a strong position to protect the steel industry from illegal dumping by other countries and to protect retirees. You can take action today to support them. Here is a link to a petition. The Steelworkers ask that you sign the petition and share with your contacts so that we can show solidarity with our brothers and sisters in Hamilton, Sault Ste. Marie, Regina, Calgary, Wabush and other regions in Canada that are directly affected by this present situation and need our support. Hundreds marched in Hamilton to support Stelco pensioners.